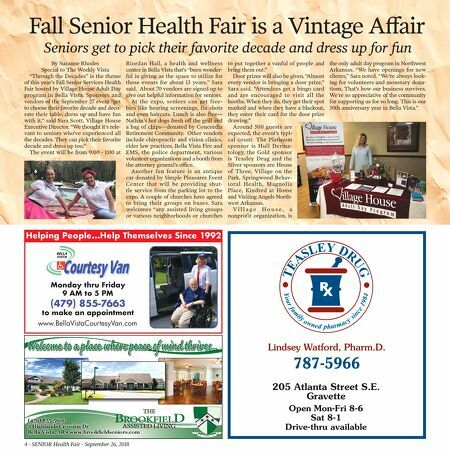 SENIOR Health Fair - September 26, 2018 - 5 Situated on 44 picturesque acres in the heart of Fayetteville, featuring premier amenities and a variety of impressive living options, come discover the active Butterfield lifestyle for yourself! Celebrating more than 30 years as Northwest Arkansas' BEST RETIREMENT COMMUNITY, as regularly recognized by regional media. Visit our website to learn more or call to schedule your tour today! Village Homes Cottages 1923 E. Joyce Blvd. | Fayetteville, Ark. 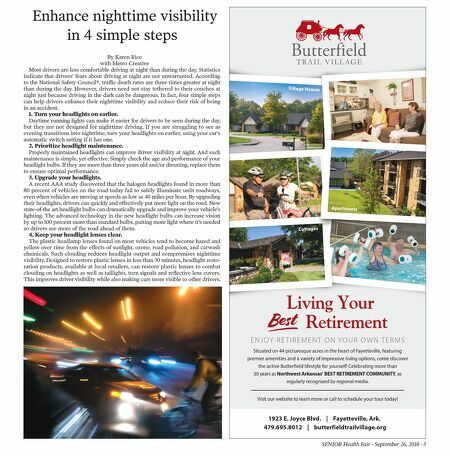 479.695.8012 | butterfieldtrailvillage.org Living Your Retirement E N J O Y R E T I R E M E N T O N Y O U R O W N T E R M S Cottages Apartments Enhance nighttime visibility in 4 simple steps By Karen Rice with Metro Creative Most drivers are less comfortable driving at night than during the day. Statistics indicate that drivers' fears about driving at night are not unwarranted. According to the National Safety Council®, traffic death rates are three times greater at night than during the day. However, drivers need not stay tethered to their couches at night just because driving in the dark can be dangerous. In fact, four simple steps can help drivers enhance their nighttime visibility and reduce their risk of being in an accident. 1. Turn your headlights on earlier. Daytime running lights can make it easier for drivers to be seen during the day, but they are not designed for nighttime driving. If you are struggling to see as evening transitions into nighttime, turn your headlights on earlier, using your car's automatic switch setting if it has one. 2. Prioritize headlight maintenance. Properly maintained headlights can improve driver visibility at night. And such maintenance is simple, yet effective. Simply check the age and performance of your headlight bulbs. If they are more than three years old and/or dimming, replace them to ensure optimal performance. 3. Upgrade your headlights. A recent AAA study discovered that the halogen headlights found in more than 80 percent of vehicles on the road today fail to safely illuminate unlit roadways, even when vehicles are moving at speeds as low as 40 miles per hour. By upgrading their headlights, drivers can quickly and effectively put more light on the road. New state-of-the art headlight bulbs can dramatically upgrade and improve your vehicle's lighting. The advanced technology in the new headlight bulbs can increase vision by up to 100 percent more than standard bulbs, putting more light where it's needed so drivers see more of the road ahead of them. 4. Keep your headlight lenses clear. The plastic headlamp lenses found on most vehicles tend to become hazed and yellow over time from the effects of sunlight, ozone, road pollution, and carwash chemicals. Such clouding reduces headlight output and compromises nighttime visibility. Designed to restore plastic lenses in less than 30 minutes, headlight resto- ration products, available at local retailers, can restore plastic lenses to combat clouding on headlights as well as taillights, turn signals and reflective lens covers. This improves driver visibility while also making cars more visible to other drivers.